But maybe that’s selling young people short. Take Archbishop John Carroll High in Radnor, where every other Tuesday evening, students meet in the school chapel as part of the Genesis program. The weekly sessions of worship, praise and faith sharing serve in part as a follow-up to the school’s annual Kairos retreat, a popular spiritual tradition descended from Jesuit spirituality and developed in the Brooklyn Diocese around 1965. 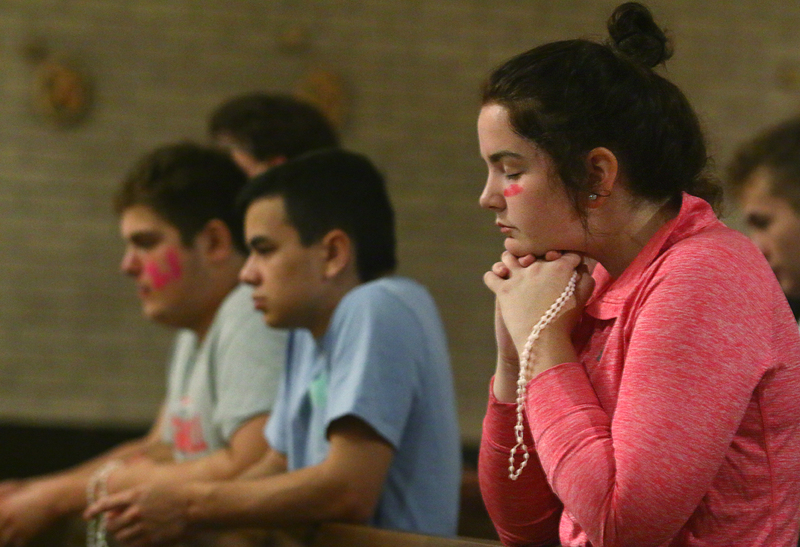 After last year’s Kairos retreat, several students approached Father Michael Speziale, director of campus ministry, about sustaining the retreat’s momentum through regular gatherings. Father Speziale agreed, but on one condition. The students did just that, selecting the word “genesis” to signify a new beginning in a deeper relationship with God. Participation in the program is voluntary and open to all grades, regardless of whether students have previously attended a Kairos retreat. The evening opens with a period of eucharistic adoration, brief interludes of contemporary Christian music and a shortened Benediction service led by Father Speziale, who is also available for confessions. The rest of the program is taken over mostly by the students themselves under a predetermined leader chosen for the evening, with discussion of a different topic each meeting. On Tuesday, Oct. 2, more than 30 students were on hand, slightly less than usual due to other campus activities, including sports events. During the summer months, weekly Genesis meetings continued, with attendance reaching as many as 100. After prayer and worship, students relax and catch up over snacks. The hospitality is also part of the program’s goal of “building Christian relationships and a new relationship with God,” Father Speziale explained. Some alumni who graduated from Carroll and are now in college have continued to attend the Genesis gatherings during the summer months, and many also plan to do so during Thanksgiving and Christmas breaks. Father Speziale noted that other high schools, such as Lansdale Catholic, offer similar programs that have experienced strong support from seniors and recent alumni. While he and his students initially visited Lansdale’s gatherings to trade notes, Father Speziale said that Genesis is designed to engage not only seniors, but students at all levels as both participants and leaders. On Oct. 2, the Genesis gathering was led by senior Kevin Cone, a member of the football team. His chosen topic focused on personal challenges, and the process of facing and overcoming them. One by one, about ten students gave witness to their own struggles — not fitting in socially, losing a good friend, experiencing difficult family relationships or losses — all of which may be magnified in one’s teen years. Each testimony was punctuated by prayer and encouragement from the group as a whole. The evening ended with small group discussions. Several students shared their reasons for attending Genesis. Chris Anderson, who recently graduated and now works full-time in preparation for his upcoming studies in secondary education at Neumann University, felt sustained by the weekly gatherings. Alexa Tarasca, a junior, said Genesis has given her an incredible outlook of people she never thought she would be able to talk to. Jess Flores, a sophomore, found that Genesis strengthened her faith in ways beyond those offered by or theology classes. Julia Staface, a senior, explained that Genesis allowed her a place in which suffering and imperfection could be viewed as opportunities to encounter God’s grace. Staface added that she herself recently proved that in her own life.